Band at LCS is offered to students from fourth through twelfth grades. Students in fourth and fifth grade are required to take band class. Middle School Band and High School Band are elective classes. LCS brings in a private instructor during band class, and additional private lessons are offered for students at an extra charge. All band students will get many performance opportunities during their time playing at LCS. Summer Band is offered to fourth through eighth grade band students. The Summer Band meets two days per week for one hour per class for the first six weeks of summer vacation. There are three Summer Band classes offered. They are: Beginning Band, Advanced Band and Jazz Band. There is a tuition charged for the Summer Band. The Summer Band performs a concert at the end of the Summer Band program. The Summer Band traditionally has the opportunity to perform the National Anthem at a Rockies Baseball game. All fourth grade students take band at LCS. The fourth grade band meets two days a week for 45 minutes. We meet together with the fifth Grade band on Fridays to prepare for concerts. We alternate with the “Standard of Excellence” method book and “Measures of Excellence” method books. Band members are required to practice at home 100 minutes per week. A practice card is turned in each week. The band learns basic rhythms through eighth notes and at least two major scales. We perform a Christmas Concert and a Spring Concert. Students may take private lessons for an extra charge during band class. All fifth grade students take band at LCS. The fifth grade band meets two days a week for 45 minutes. We meet together with the fourth grade band on Fridays to prepare for concerts. We alternate with the “Standard of Excellence” method book and “Measures of Excellence” method books. Band members are required to practice at home 100 minutes per week. A practice card is turned in each week. The band learns basic rhythms through eighth notes and at least four major scales. We perform a Christmas Concert and a Spring Concert. Students may take private lessons for an extra charge during band class. Middle school students perform for the LCS student body. The LCS Middle School Jazz Band is open to LCS students by audition only. The LCS Middle School Jazz Band plays advanced level middle school jazz style music. We meet before school two mornings per week. The LCS Middle School Jazz Band performs three concerts per year and attends one band festival. Students learn basic jazz and improvisation styles of music. The LCS Middle School Band is open to all middle school students with at least one year of band experience. There are no auditions to be in the LCS Middle School Band. The Middle School Band meets every other day for 45 minutes. Band members are required to practice at home 100 minutes per week. A practice card is turned in each week. The LCS Middle School Band plays level two music. The band learns seven major scales. The band performs three concerts per year and attends one band festival. The LCS Middle School Band performs pep band at one LCS High School basketball game each year. Students may take private lessons for an extra charge during band class. The LCS High School Band is open to all high school students with at least two years of band experience. There are no auditions to be in the LCS High School Band. There are no practice requirements and no practice cards. The High School Band meets every day for 45 minutes. The LCS High School Band plays level two and three music. The LCS High School band learns jazz and concert style music. The band performs four to five concerts per year and attends two band festivals. The band takes a major trip every two years. This year we are going to perform two concerts in Branson, MO. Students may take private lessons for an extra charge during band class. 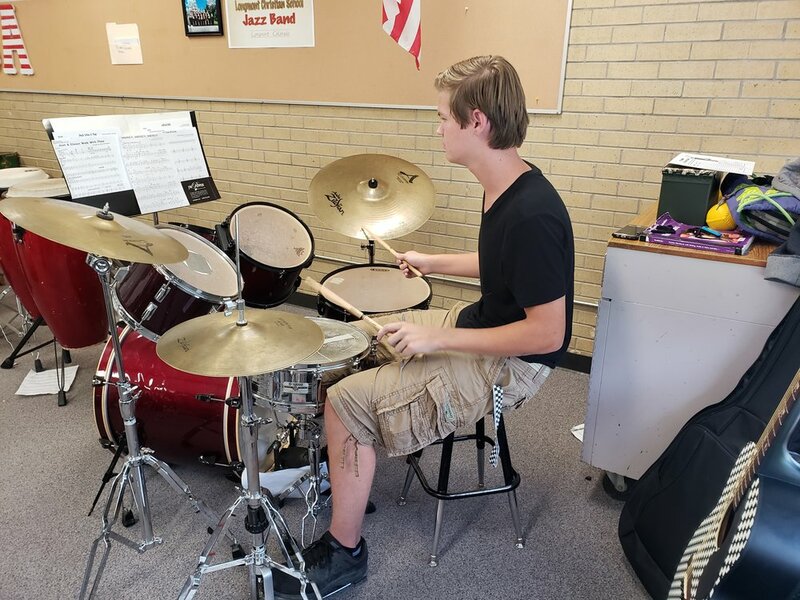 An LCS high school student practices drums for an upcoming concert.